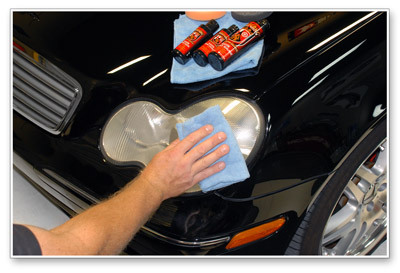 Home > Shop By Brand > Wolfgang Concours-Series Car Care > Wolfgang Plastic Headlight Lens Glaze 4 oz. Most auto manufacturers now use polycarbonate headlight lenses on their vehicles. Window grade polycarbonate is perfectly clear and highly impact resistant. It’s “soft” compared to many other rigid plastics, which allows it to bounce back from considerable impact. 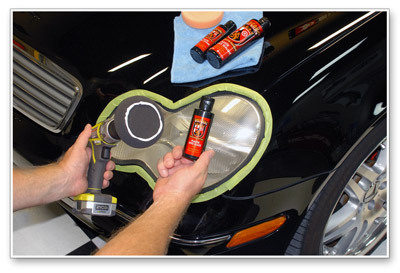 This softness also allows it to be polished to correct scratches and cloudiness. You can imagine that it takes an aggressive polish to penetrate plastic, so the initial results may appear rougher than you’d like. To restore the smoothness and optical clarity of the lens, use Wolfgang Plastik Lens Glaze. Apply Wolfgang Plastik Lens Glaze using a 4” gray pad adapted to your cordless or electric drill. You may also use your circular or dual action polisher adapted to a 4” pad. Set the maximum speed on a dual action polisher at 5000 OPM. Set your circular polisher at no greater than 1500 RPM. Polish until the glaze starts to dry. Buff away the residue with a microfiber towel. After you’ve completed restored your lenses, seal in the shine and clarity with Wolfgang Plastik Surface Sealant. It will prevent future damage and maintain the transparency of the lenses. Try Wolfgang Plastik Lens Glaze as part of the Wolfgang Lens Cleaning System and you’ll see a clear difference. 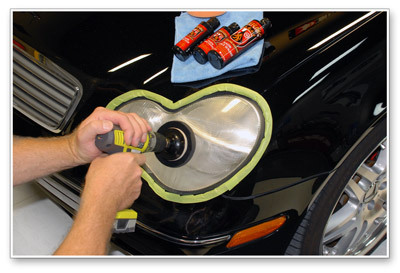 Wolfgang Plastik Lens Glaze is recommended for motorcycle windshields, visors, or clear vinyl windows. The gentle formula will not scratch these surfaces as it removes cloudiness, yellowing, creases, and scratches. You can use the complete system on motorcycle headlights. Use the Wolfgang Plastik Lens Glaze to gently remove scratches and cloudiness. Then apply Plastik Surface Sealant to protect the vinyl from future damage. Wolfgang Plastic Headlight Lens Glaze 8 oz.